There are two primary materials used for memorials: granite and bronze. Each can be customized to meet the individual design requests of the client. Often, the cemetery where the memorial will be placed will have regulations on what type of material that can be used. Case Memorials is familiar with these requirements and can assist in this selection. The wide variety of memorial concepts available allow us to design a fitting tribute for whatever your budget may be. Case Memorials will work through this process with you, ensuring that you are aware of all the options available. Size — The cost of the memorial is directly related to it’s size. The larger the monument, the greater the amount of material, production, and transportation costs involved. Design — With modern technology, the design options for your memorial are almost endless. Monument design can range from a simple, standard marker to a custom design, wholly unique to the individual. The level of design chosen will effect the overall price of the monument. If granite is selected as your memorial material, there are several different styles of monuments available. Each style can be customized to meet your individual requirements. As with the type of material allowed, cemeteries typically have requirements of what type of monument styles are allowed. Case Memorials is familiar with the individual requirements of each cemetery and can assist you in making sure that the monument style you select fits with these regulations. Is there a difference in the quality or grade of granite used for memorials? Yes. Inferior granites will hold moisture and stain. They also can have a poor contrast so the engraving won’t show up as well. We only purchase the top grades for all of our memorials. 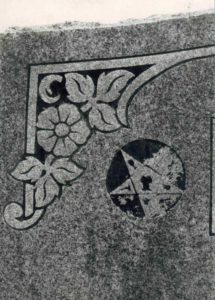 How deep do you cut the lettering and carving into the stone? We cut all of our sunk letters to the deepest possible depth. Do you use any artificial black spray in the letters and carvings? We do not use the black or white sprays because in time they will fade or flake off. If engraved properly, sprays of this kind are not necessary. Do you shape carve the designs? What training do you have? We do shape carve our designs. Sharp carving is a relief carving technique that gives the design a three dimensional look that shadows and enhances the look of the design. We have been trained at a special vocational institute and have done this type of carving for many years. Do you do personalized designs? Is there additional cost for that? We do a lot of personalized designs and encourage our customers to consider it. Most are included in the cost of the memorial. The exception to that are the laser etchings and larger scenes we create. How deep are your foundations? Straight sides, no taper in or post holes? 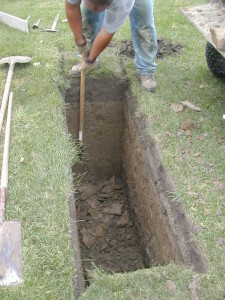 All of our foundations have a minimum depth of 36”. We go 48” deep on larger two-piece monuments. We dig our foundations straight down on all four sides and use a quality grade of ready mix concrete. Tapering or post holes will give the frost leverage to force the foundation up causing it to become unlevel. Do you fully warranty the memorial and foundation? Yes. All of our memorials are fully warranted. Please see the Warranty page for details.